After the blistering heat of this summer, the sudden drop in temperatures into the 40s at night was a welcome change, though it means a mad dash to harvest the last of the basil and tomatoes. We processed a couple batches of pesto today and used some of the Thai basil and some of our peppers to make our favorite Thai Basil Chicken for dinner. Tomorrow we’ll continue cutting down the basil and will freeze it into cubes to add to sauces and soups during the winter. The tomatoes won’t last in these cool temperatures, so we’re taking them down, too, and making fried green tomatoes (recipe coming) as well as pickling them. The tomatillos actually hold up well in cold temperatures, so we’ll deal with them later. They won’t produce anymore, but the tomatillo fruits hold up well in the cold, much better than tomatoes do. What do you do with your end of season basil and tomatoes? I planted my basil too late this year – sort of like an afterthought. I am regretting now because I’d love some pesto, or maybe canning some tomato sauce or making bruschetta. I too need to save my tomatoes before the first frost. Hi, Andrea. I’m doing a lot of what you’re doing – pesto, frozen basil cubes. I’m freezing some pesto and whole tomatillos, too. And I’ve made several two-cup glass jars of tomato salsa and tomatillo salsa. I have some frozen pulled pork, so those will make an easy dinner one day – pulled pork tacos with one of the salsas. 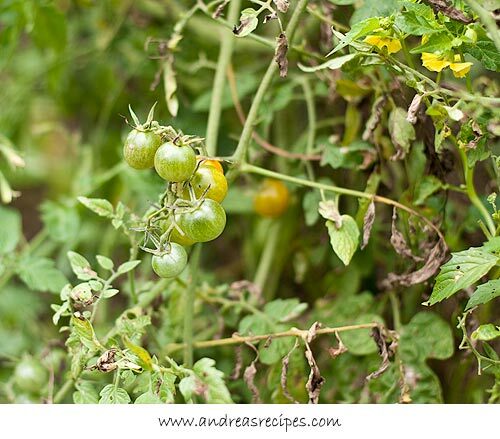 I have a great recipe for green-tomato gratin that I’ll be making, too. It’s just sad isn’t it? 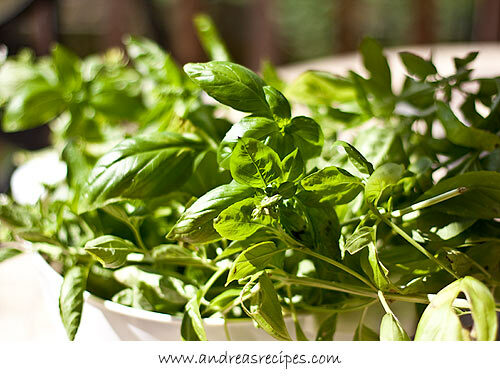 I’m cutting down my basil today too. I tried your recipe for canning cherry tomatoes and really liked it. I substituted one cup of Apple cider vinegar and added tyme and added peppers and onions of all sorts. They came out excellent. Oh yeah and a 1/4 cup more salt.